This is the most common asked in the domain name industry. 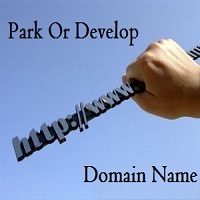 Many domain name investors want to know we should park or develop the domain names. Obviously it will take time and money to develop a domain name but still confusion is there we should park or develop domain name. Domain parking is a service provided by the domain parking companies to generate some revenue with the help of the domain if you are not using your domain name or not developing your domain name. Domain parking is a very good way to make money it did take less effort and consume less time to park a domain. So if you are having the domain and do not want to make the website of the domain and purchased this domain name for the selling purpose then domain parking is the best way to make money from your domain name. You just need to signup for the domain parking companies and submit you portfolio to them for the parking. These parking companies will put the ads on your domain name and when any visitor come to your parked page then if he clicks on the ads then it will make money for you. Domain developing is the process in which we develop our domain instead of parking domain name. Basic meaning of domain developing is to make the website of your domain name. If you develop your domain name then this thing will increase the Domain Authority of your domain name. Domain developing will increase the popularity of the domain name. A website is how much is popular on the internet can be measured from his Alexa Rank. For domain developing you need to make website by having the good hosting plan. If you are having lot of domains then then you can go for hostgator baby plan because it is cheap and having good service also it is good for beginners. take anyone hosting plan from above which suite you good. Then install the wordpress for your domain name and start making website for your domain developing project. You can go for Pinboard theme which is very good and very fast free theme available on the internet. All you need to do is that you need publish good quality content on your website so that it will rank good in the google search engine and if your search engine ranking is good then your domain name would be popular on the internet which automatically increase the value or strength of your domain name. Domain Parking Or Domain Developing? As we have discussed above in the article we should park the domain name or develop the domain name. Parking and developing are the two very different thing. If you have purchased a new domain name now you want to in which thing it would be beneficial for you to park a domain name or to develop a domain name. Now if you have purchased a domain name now its time to check the traffic of the domain name. Keep in mind one thing that if you have purchased a domain name that is first time registered in his life cycle then there are less chances of getting the traffic from search engine. If you purchased a expired domain name then there may be chances of getting traffic from his backlinks. Then see the results of your domain name how much traffic is getting your domain name. If your domain name is getting the traffic and having the good CTR or click through rate then it is good indication for you to be your domain name on parking. Because without any effort you are earning money. If it is getting good amount of traffic but there is no any CTR or Click Through Rate. It means people are coming but they are not getting what they want. It means people are intreset in your domain name only if you will provide the content to them. In this condition it would be better for you to develop your domain name . (1) Domain parking consume less time. (2) Domain parking generate good amount of money. It would be good for you to develop your domain name because it makes the domain authority of your domain and makes the backlinks of your domain which gives the good amount of traffic to your website. Domain developing gives the organic traffic to your site which is known as very good traffic over the internet also if your domain name is pre developed then your domain buyer would be more intrested to your domain name because he did not need to do lot of SEO of website also because he is not only buying a domain name from you but also he buying a site with it. In other words buyers is not only buying a domain name from you while he is buying a business website.